Court hands former PM another month in jail in addition to Holyland scandal sentence; he will begin serving time in 5 days. In the ruling on Wednesday, the court rejected the plea bargain formed between Olmert's attorney and the state, according to which he was to serve six months instead of the year-and-a-half he was sentenced to in the Holyland affair. 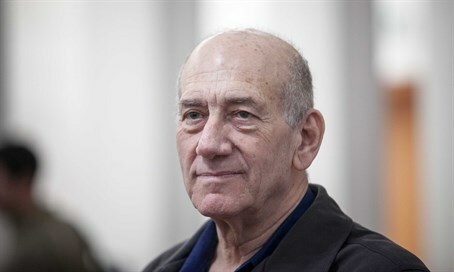 Instead of the plea bargain, Judge Avital Chen sentenced Olmert to an additional month, bringing his total jail sentence to one year and seven months. In addition he was handed a 50,000 shekel (nearly $13,000) fine. In the previous hearing on the plea bargain, Chen criticized the light sentence being requested given the evidence against the former prime minister. Next Monday, Olmert is to begin serving his jail sentence for the Holyland affair. Wednesday morning's court hearing was his last public appearance before beginning his sentence at a special jail branch with deluxe conditions.